Twin Valley Distillers, the first distillery to operate in Montgomery County since Prohibition (that was nearly a century ago! ), debuted four of its spirits today at the Olney Farmers and Artists Market thanks to a recent loosening of Prohibition Era regulations (when can we eliminate the county’s liquor department?). 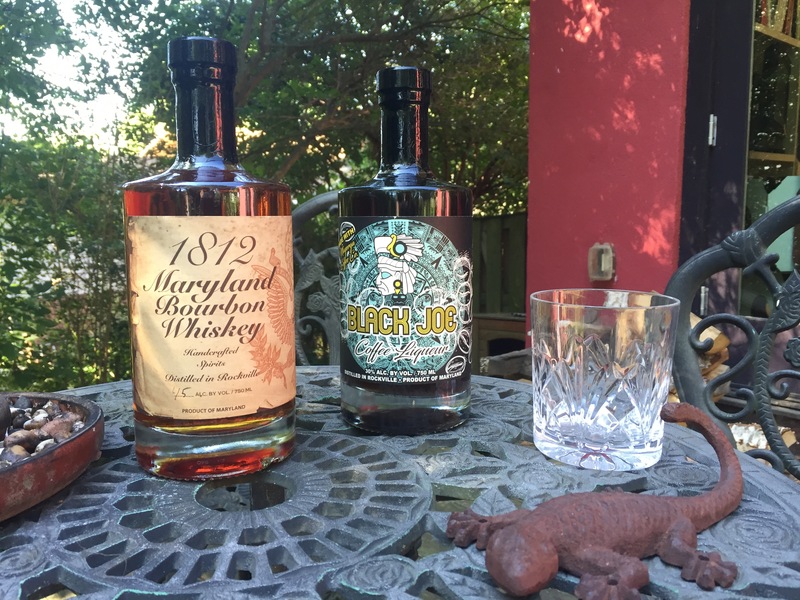 They offered tastings of their 1812 Maryland Bourbon whiskey, Aged Wimsey gin, Dirty Apples cinnamon flavored whiskey, and Black Joe coffee liqueur, offering special discount prices of $25-35 per 750 ml. They also produce rum, rye, and vodka, but didn’t bring them along for this debut. Twinbrook neighbor Matt Von Hendy mentioned this place to me a couple months ago but I couldn’t fathom a serious distillery business was actually in operation in our hometown. Boy, was I wrong. The owner is serious and the products are much better than expected. The Bourbon whiskey and coffee liqueur were surprisingly good, so I picked up a bottle of each. 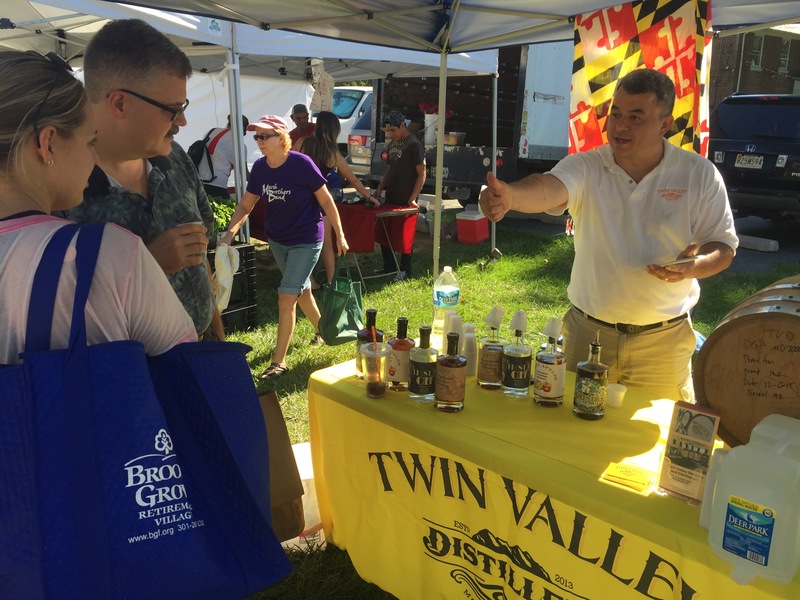 If you want to try some yourself, I suspect they’ll be returning to the Onley Farmers Market on Sunday mornings but you can also experience a tasting and a tour at the distillery on Friday, Saturday, or Sunday afternoons at 711 East Gude Drive, Bay D in Rockville. This is in an industrial area, so you’ll need to watch the address numbers and be a little adventurous. To find it, look for Maaco and Abka Marble & Granite Countertops and pull into the parking lot. At the back of the parking lot is a blue and white “White Flint Collision Center.” Drive through the gates on the left and go around to the rear of the building to park and enter the distillery. Twin Valley has plenty of orange signs leading you there but that area is full of signs and they just get absorbed in the clutter. For those of you that support “farm to table,” you can now expand your pantry to include liquor! The spirits are not only made in Rockville, but the ingredients are sourced locally as much as possible. Local farmers supply all the grain for the spirits and Mayorga, which is also based in Rockville, provides the organic coffee. On October 1, Montgomery County will allow Twin Valley and other distillers to sell directly to restaurants and bars, so you’ll see it appear more frequently (right now, there’s no place in Rockville to buy or drink these Rockville-made spirits except at the distillery. Ugh.). Two Rockville Restaurants Named Best "Cheap Eats"